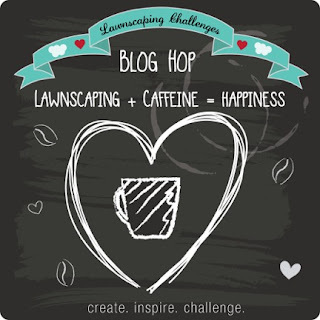 I am so very excited to be part of the Lawnscaping + Caffeine = Happiness Blog Hop! 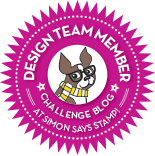 Welcome to my blog you should have arrived here from Amy's blog. 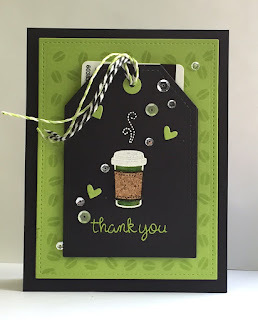 What an appropriate theme for me, coffee is my go-to drink and it does equal happiness in my little world! 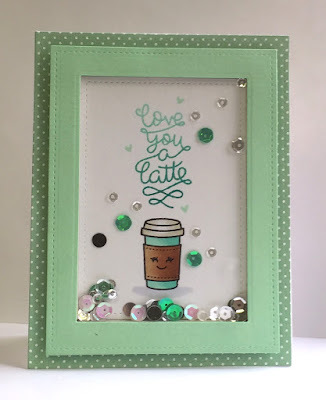 I ended up making three projects featuring Lawn Fawn's Love you a Latte set for this hop keep scrolling to see them. There are so many wonderful sponsors for this blog hop: Lawn Fawn, Ellen Hutson, The Ink Road, Crafters Companion, Spectrum Noir, The Alley Way Stamps, Newtons Nook, Faber Castell, and Right at Home! 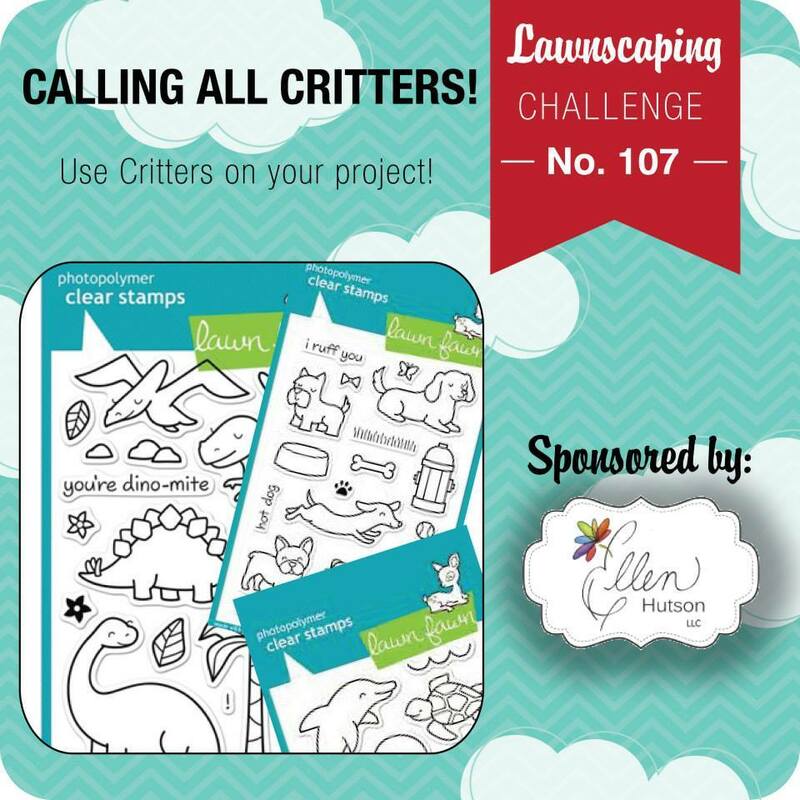 Don't forget to leave an original comment on each stop on this hop to qualify for one of the wonderful prizes! 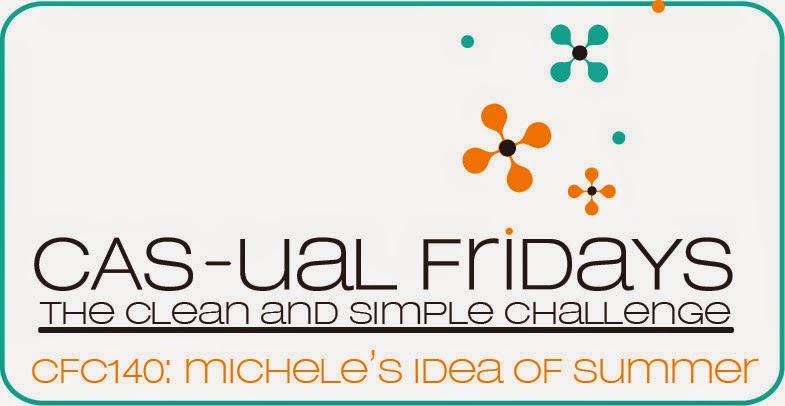 And your comments must be made before 11:59 p.m. Eastern Standard time on June 28 to qualify. Got Coffee? What's better then coffee and rainbows! Aside from the Love you a Latte Set I also used Lawn Fawn's Voilet's ABCs, one of my favourite letter sets the slim scale makes them easy to use on projects. I Copic coloured the coffee cups and piled them high! For my rectangle I used the Lawn Fawn stitched rectangles by cutting half of the paper first then readjusting to cut the second side to make a longer card. I also added, of course, PPP sequins. This one will more than likely go to one of my nieces or nephews, yes I am a bad auntie and I introduced them to Starbucks! I made a shaker for this one with a mix of PPP sequins. 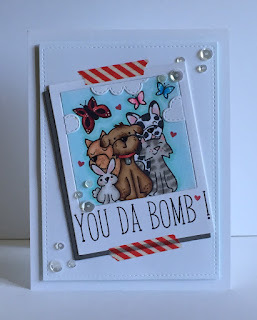 I used the Lawn Fawn Let's Polka Mon Amie 6 x 6 for the background and some SSS mint cardstock for the frame. 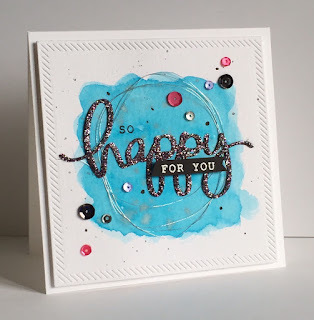 The ombre ink is Hero Arts Mint to Green. 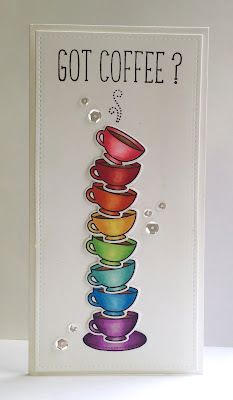 The last one is a gift card holder, I often give Starbucks or Tim Horton's gift cards to friends. Can never have enough of those! 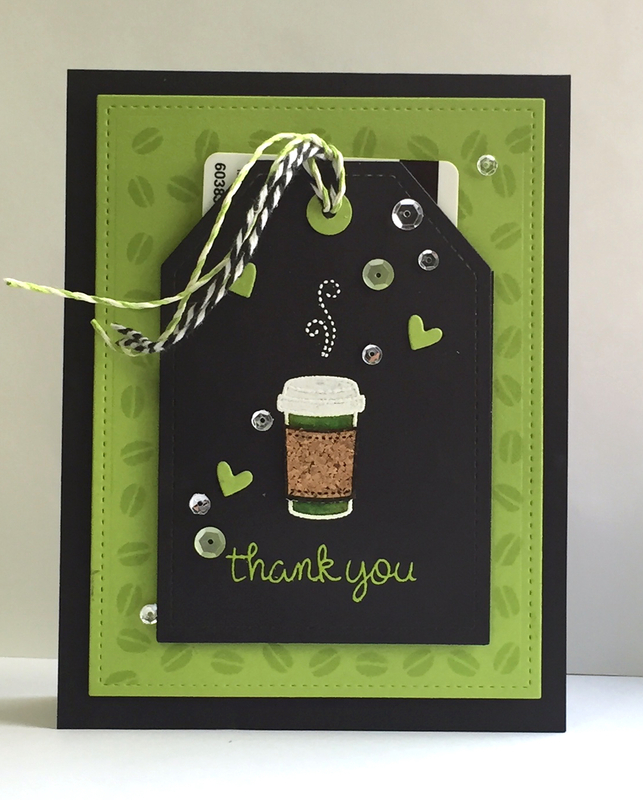 Mimicked a Starbucks cup and tried to make a more masculine card. 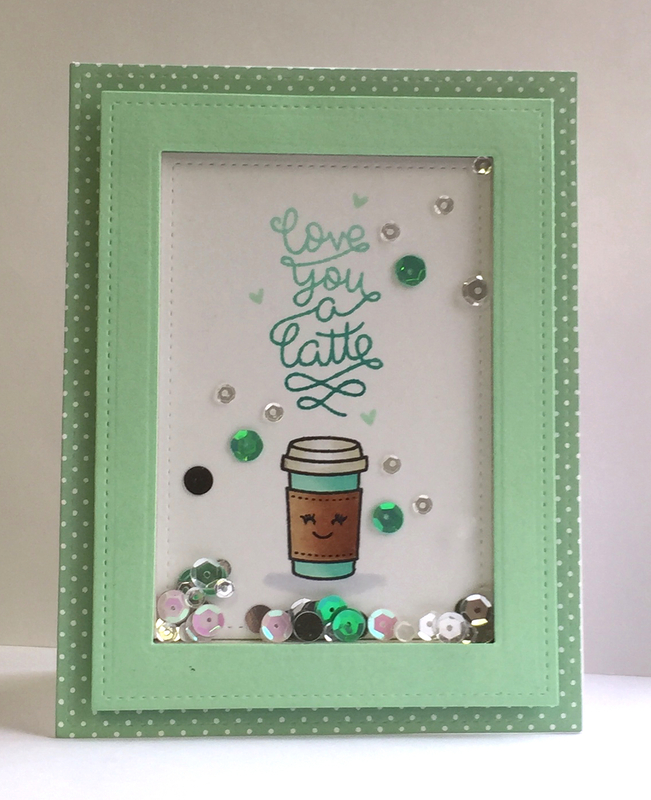 I used the coffee bean from the Love you a Latte set for the green background added some Lawn Fawn die cut hearts, Lawn Trimmings in green and sequins. 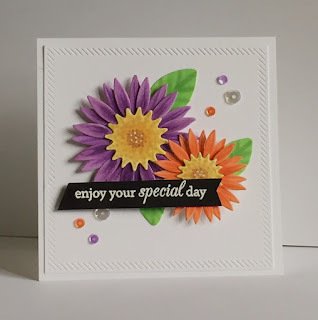 Thank you so much for taking the time to join me for the Hop today, I really enjoyed making these projects. 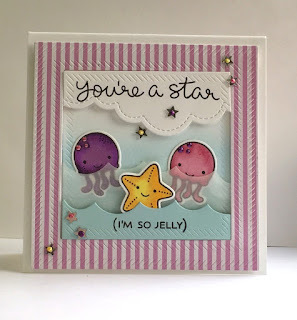 Your next stop on this hop is Monica M.
Used So Jelly and some Copic colouring. MFT square diagonal dies. 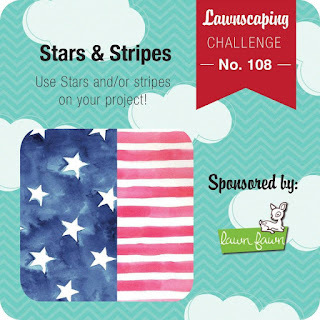 Lawn Fawn Wave border dies and the Puffy Cloud dies. PPP stars. 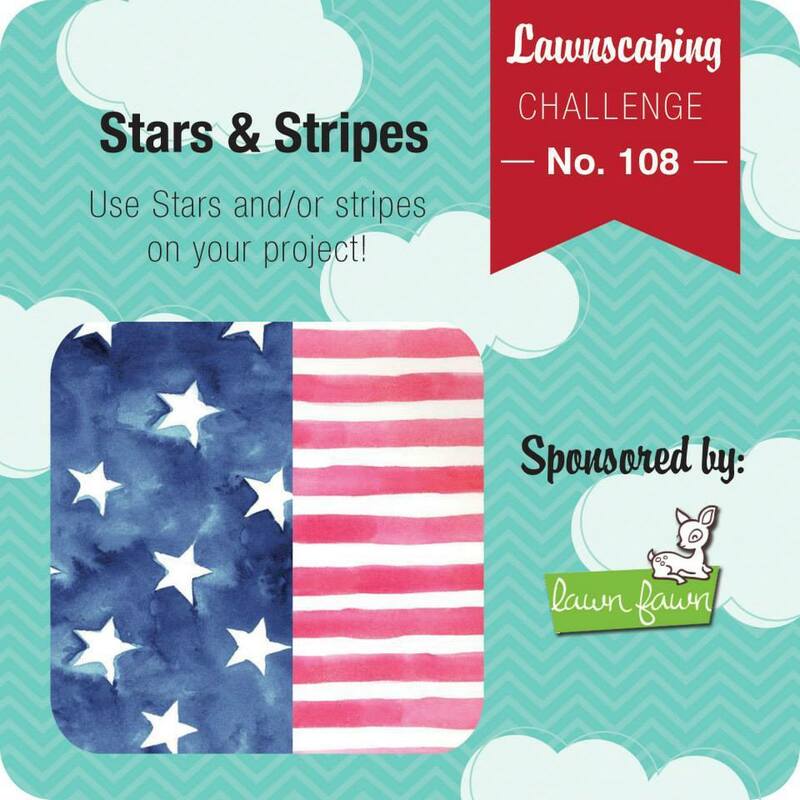 The challenge this week at Lawnscaping is Stars and Stripes, I used the Critters Ever After set that I actually just bought a few weeks ago . 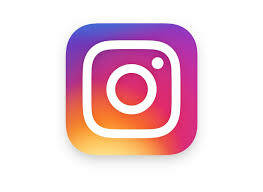 I love that unicorn! 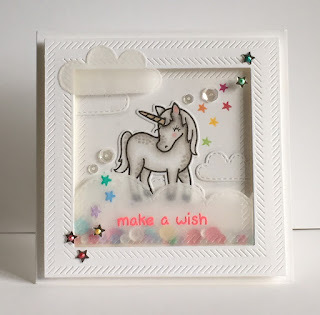 And What is a unicorn without stars!!! It is a shaker card with a rainbow of sequins from PPP. I really enjoy playing along with the Runway Inspired Challenge, I find that the inspiration photos always make me think outside the box. 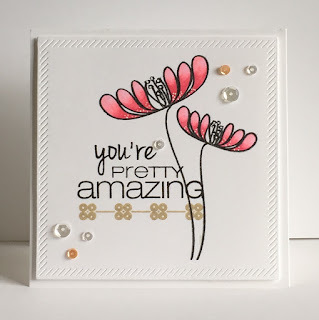 For this one, I mixed a watercolour background with a custom glitter mix for the die cut sentiment. 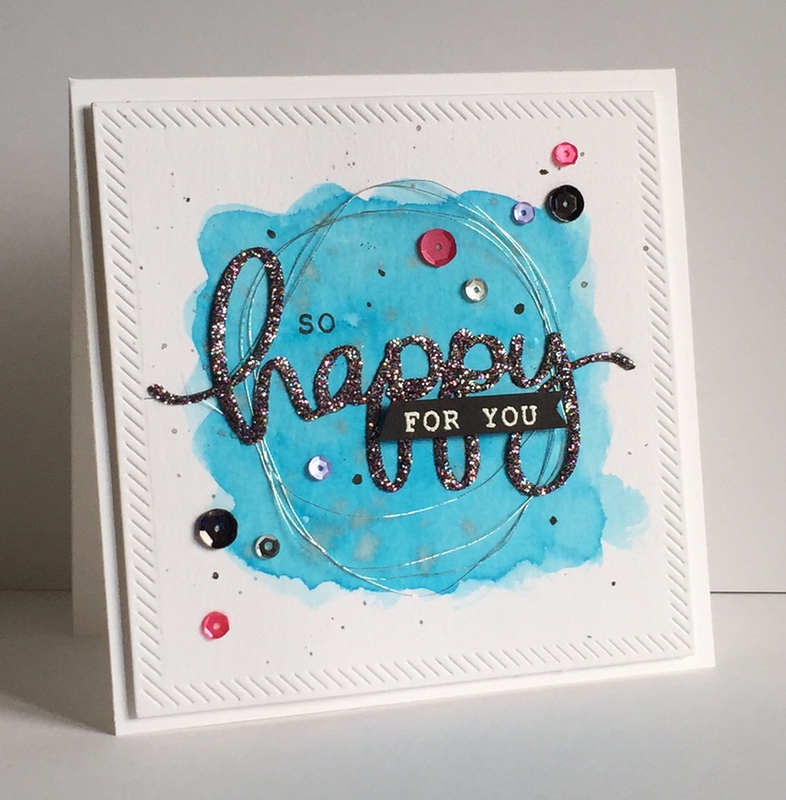 The sequin dress was my starting inspiration and the blue shirt inspired the background! 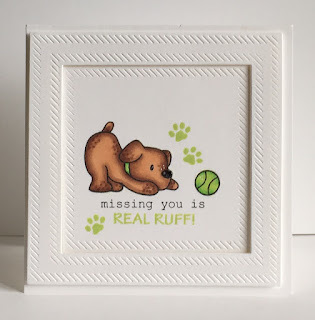 I received happy mail on Friday, my Mama Elephant Playful Pups! I had to get them out over the weekend and play! 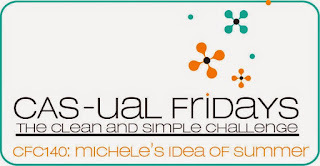 The current Mama Elephant Flickr Challenge is CAS or clean and simple. I paired the playful pups stamp set with MFT square in and out diagonal dies. 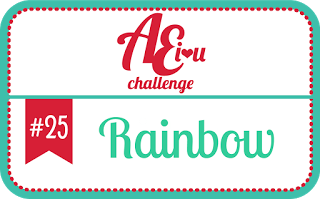 The challenge theme at AEIheartu this month is rainbows! 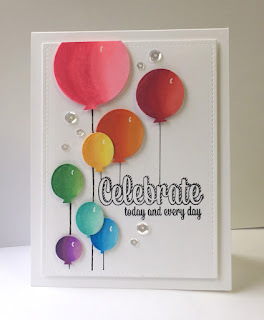 I had a lot of fun with this one, I used the Balloon dies from Avery Elle (they go with the Balloons stamp set) and coloured them with Copics. The sentiment is Avery Elle's Celebrate. 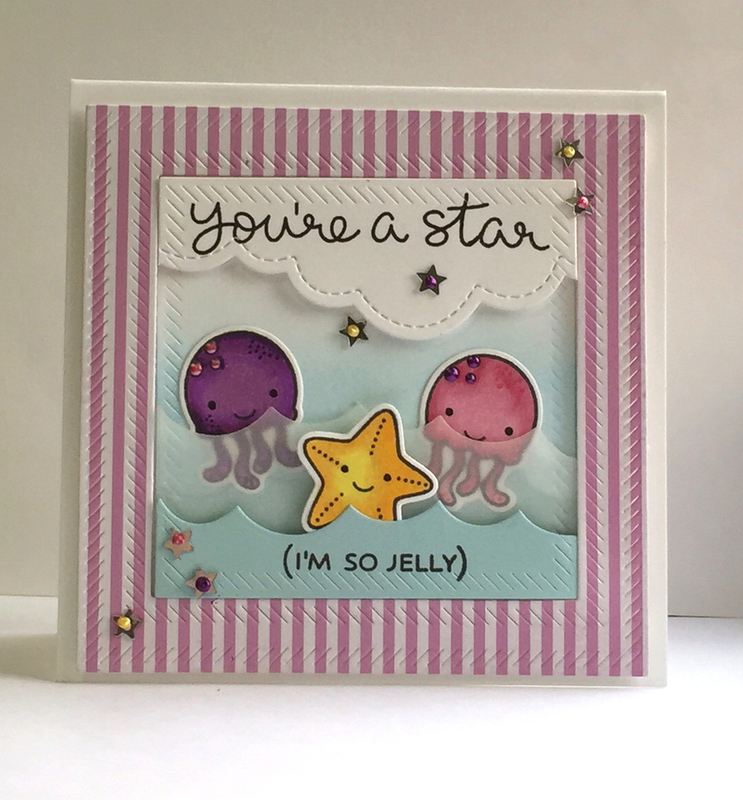 I also added a sprinkling of PPP sequins.